This project started as a 2012 leader-ender project. 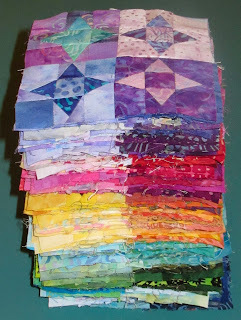 Blocks were made slowly over the years, here and there from time to time, sewn in between piecing the other quilts that made their way through my quilt studio over the years. Wow that's beautiful if I do say so myself! 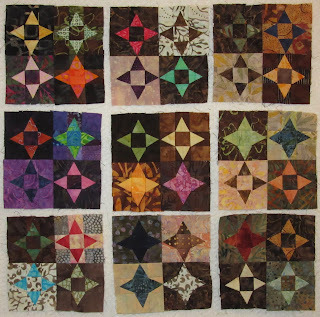 I prefer rectangular quilts, so I'm thinking of rearranging the blocks into a layout of 16 stars across by 18 stars down. 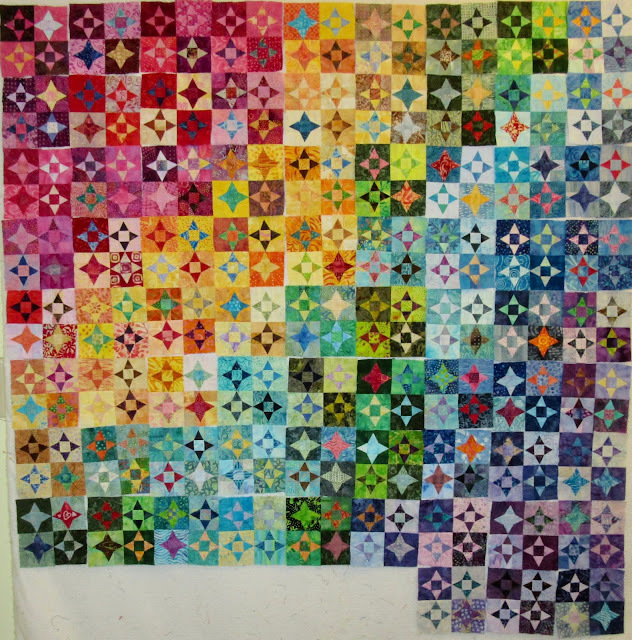 The fact that in the past 7 years I have never put the blocks on the design wall together is a testament to the fact that quiltmaking is really all about the process (for me). I just love playing with colour and fabrics, and constructing quilt blocks! I did not have a vision of what I was making or how big it would be at the beginning. I just started making little blocks for fun. It might have become a mug mat, or a placemat, or a table runner. But it has grown into a wall hanging now and I don't really want to make any more as I feel done with making this block. 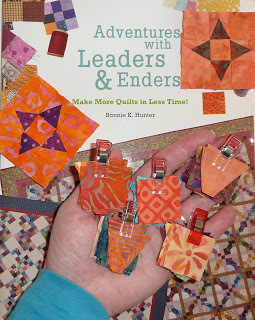 Thank you to Bonnie Hunter for her ideas which revolutionized my way of sewing with the leader/ender concept. The blocks for this quilt were sewn together using her construction methods. I have some muddy dark blocks that I'm not sure about putting in. What do you think of these? They kind of don't fit in with all the colour saturated blocks. But maybe a quilt (and life in general) needs some of this muddiness to appreciate the colour? When I look at the old photos of block construction for this project I marvel at my former highly organized self, dealing with so many little scraps. Each star block finishes in the quilt at 2.25" and has 17 pieces. This is a box that Julie sent me many many years ago that was perfect for keeping my strips, pieces and blocks organized. Thank you to my blog readers for their encouragement on this project and for occasionally asking about the status of the Alamo project. 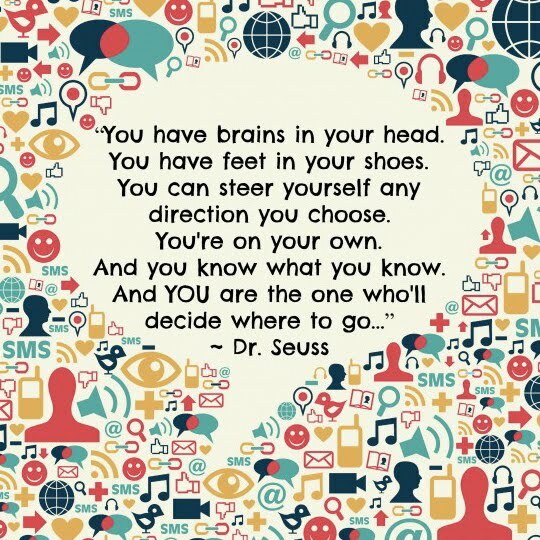 I really appreciate your interest and support over all these years! 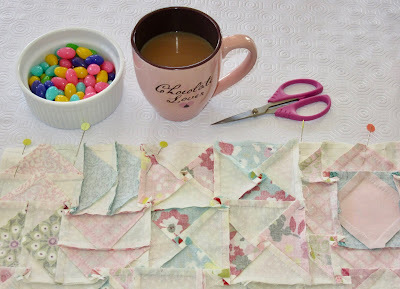 Linking up to Design Wall Monday at Small Quilts and Monday Making at Love Laugh Quilt. Welcome to the weekly hand stitching party! Take a few moments to set aside your machines, your devices and screens, and just take a deep breath... ahhh... so much better. Now pick up your needles and fibres, and put a few stitches into your project. 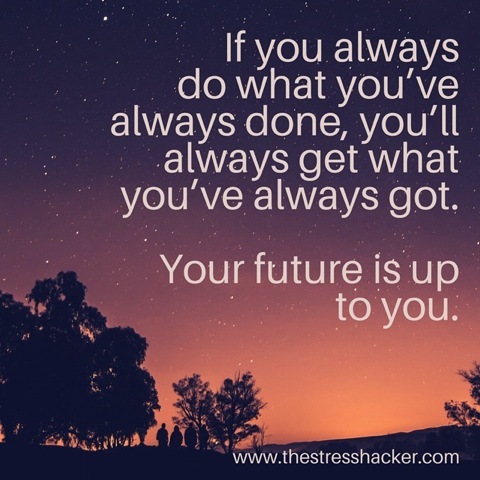 You will feel better in no time! Today I am slowly working on my hand pieced quiltalong project. This task seems to require a lot of coffee and treats! There are a few holes that have appeared in places where I didn't connect the units properly. 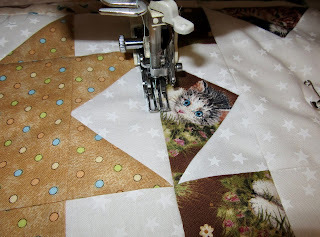 My hand stitching friends said not to worry, that "the quilting will take care of the gaps". So I decided to hope they are right and just accept the holes. I didn't have much of the background fabric left, and the rest of the fabrics were from a charm pack, and I had nothing that suited this project for sashing. Hence, there will be no sashing. It might be a bit of a busy mishmash, but that's just the way it goes sometimes! 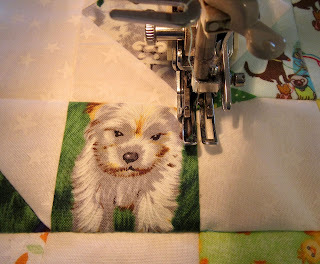 What are you hand stitching today? Are you have any challenges... like holes appearing in your project, or not having the right materials for the next step? 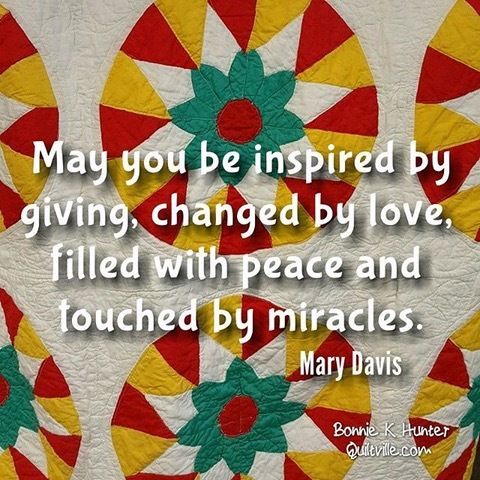 Link up your blog post below and share your miseries and successes with your slow stitching friends! 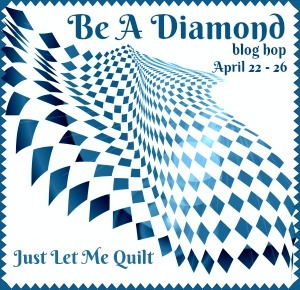 The past week was so busy I didn't get much quilting or blogging done. I have been working on my hand piecing for the quiltalong, and am almost ready to add the border. And I have been sorting out aqua scraps for my RSC projects. 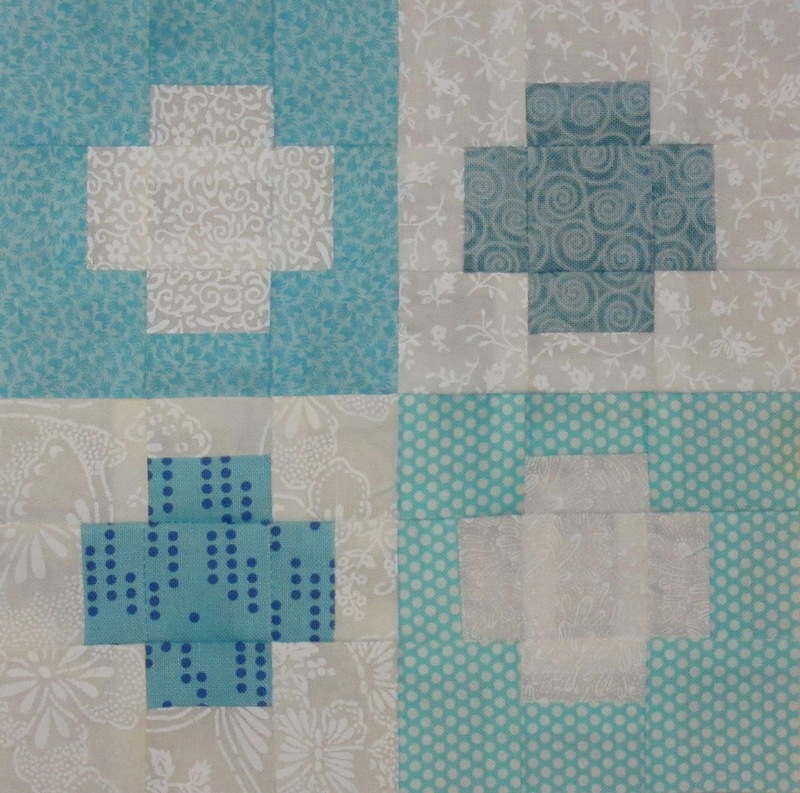 I did enjoy sewing some little tiny blocks on my white Featherweight. I love this machine so much and it's just perfect for sewing these 1" pieces. Here are the 3" Economy Path blocks for April. 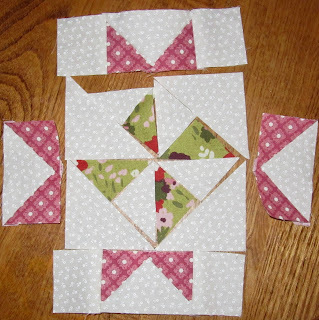 I am making 4 blocks each month and this pattern is perfect for using up my smallest scraps. 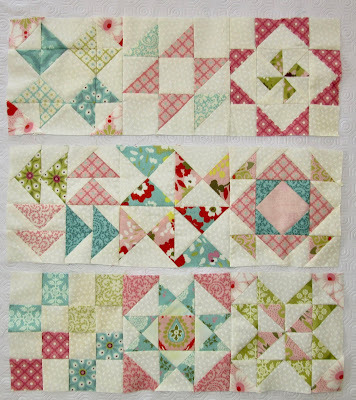 Even though they are small, these little gems take at least as much time to cut and sew as a regular size block. 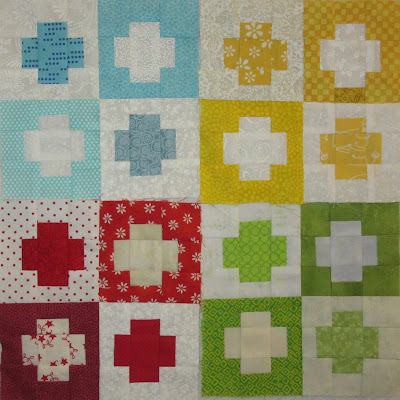 And speaking of tiny blocks, I've been working on my Alamo Star project so stop by on Monday to see them on the design wall for the first time since I started working on them almost 7 years ago! 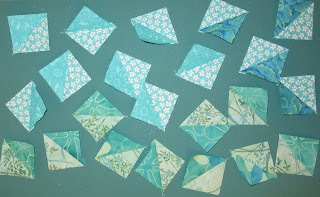 Hop over to the RSC weekly link up and see what other folks are sewing with their aqua scraps. 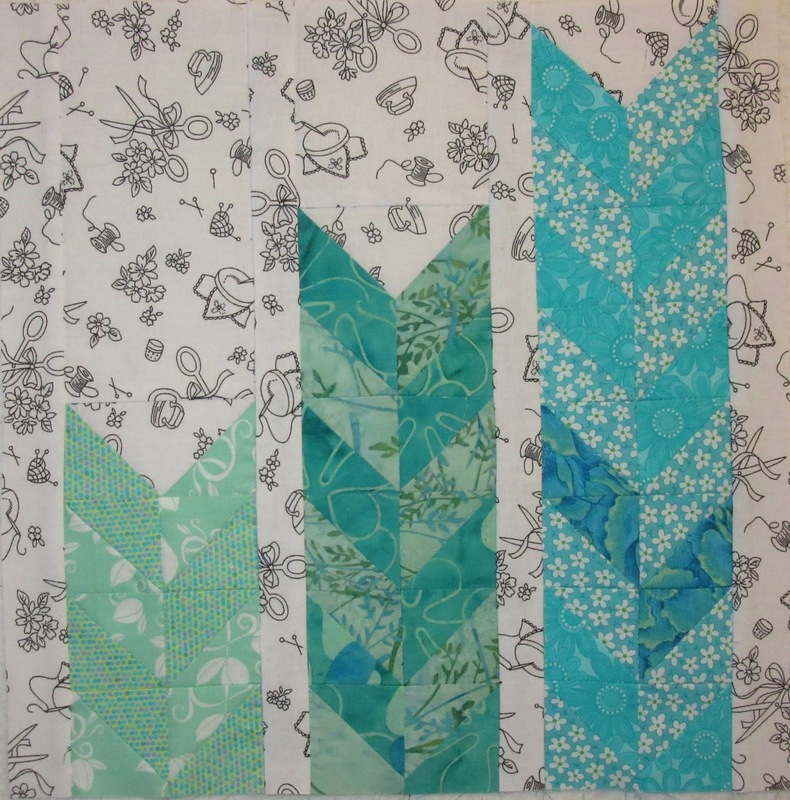 The quilt project I started at a class on Worldwide Quilting Day is on the design wall. I just have to finish 2 more blocks and get the whole quilt top sewn together by tomorrow. It's guild meeting and we are supposed to bring our quilt tops and finished quilts to the meeting. I'm still trying to decide on sashing or no sashing, but the time deadline may make that decision for me. 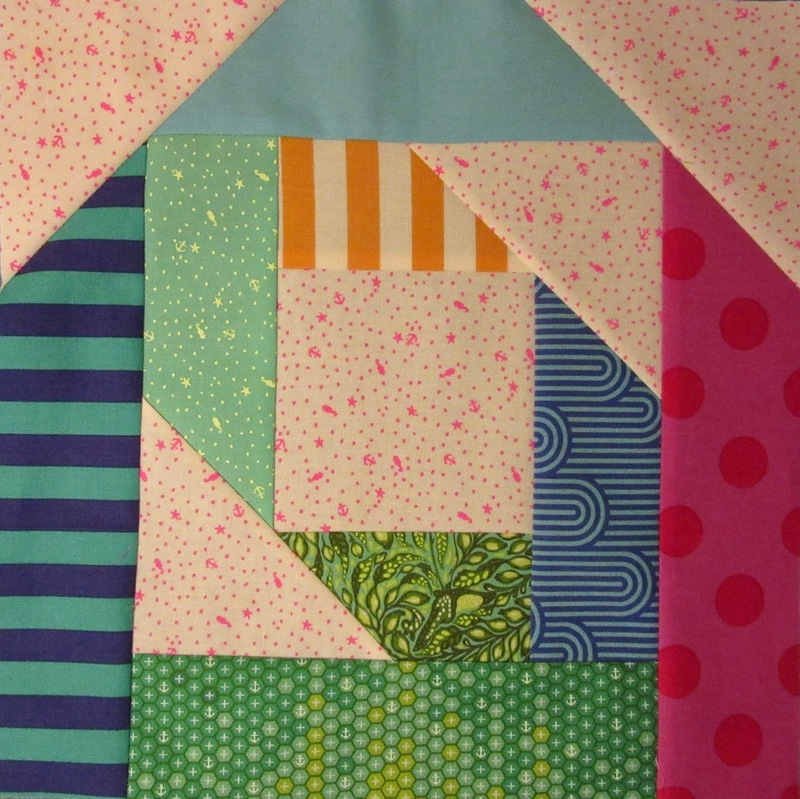 It's one busy quilt, but I do love the Tula fabric! It would be ever so helpful if the sewing would go more smoothly than it has been. Part of the difficulty is only having time to sew late at night when I'm tired. Linking up to Small Quilts. Welcome to the weekly linkup that celebrates the art of hand stitching! We are all about pure relaxation, taking deep breaths, and taking one s l o w stitch at a time. 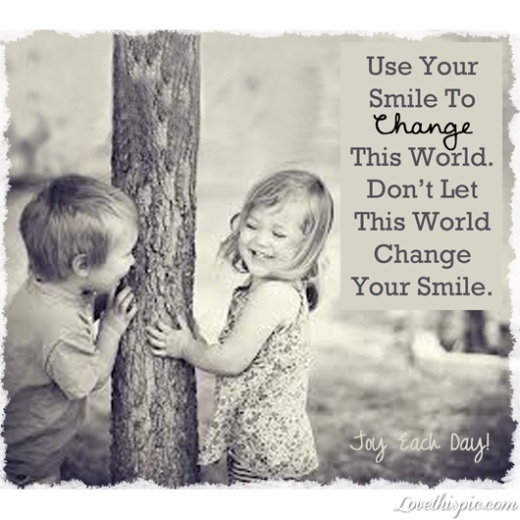 I have been looking forward to today and have 3 projects lined up ready to receive some attention. First, I have a baby quilt binding to stitch that I have been looking forward to finishing (since the baby arrived in February). 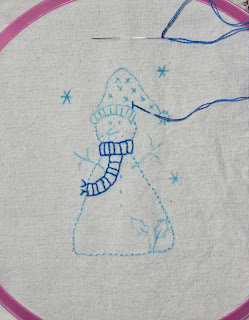 Second, winter needs to be over and so this snowperson embroidery also needs to be done! SO done with winter weather! 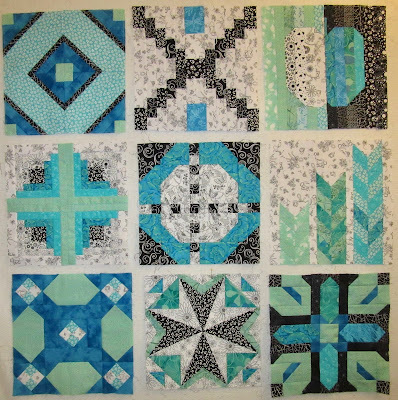 Third, I would like to finish the last hand pieced block for the quilt along so that I can finish the quilt top before the deadline. However, I think I cut some (or all) of the inside triangles incorrectly. 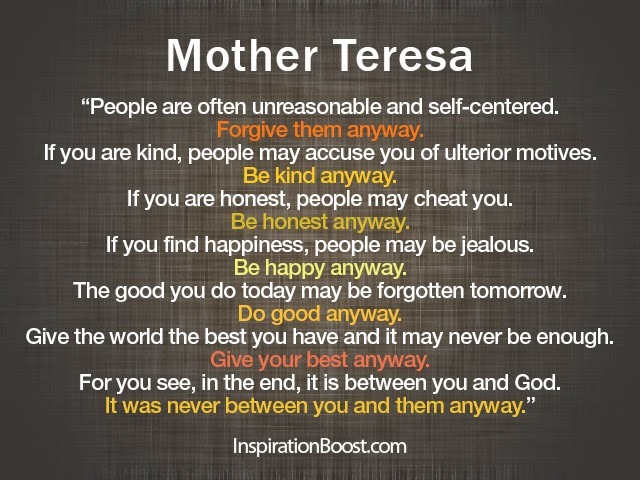 I'll work on it today and see what I did wrong. Hoping that the new Inlinkz linkup will work for us today. Fingers crossed! The RSC colour for the month of April is aqua. This is a colour that I don't often buy, don't notice at the quilt store, and used to dislike (see quilt retreat report from 2007!) But participating in the RSC has helped me to become friends with this colour and to see the benefit of using it in scrappy quilts. The March Aurifil BOM designer of the month is Sedif Imer and she designed a block called Harvest Block. 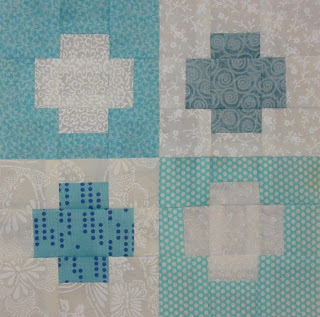 I used some scrappy aqua fabrics to make the HSTs for this block. 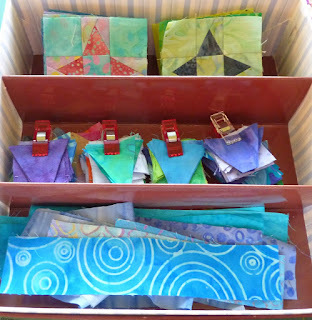 Here are all the Aurifil blocks that I have made so far. 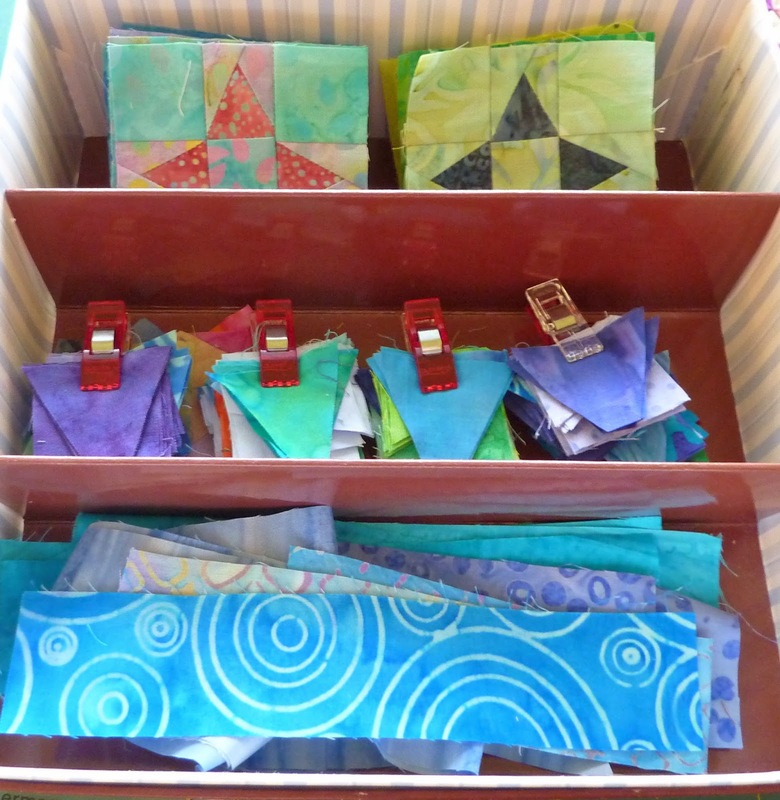 There are a few from last year's Aurifil DOM and a few from this year. 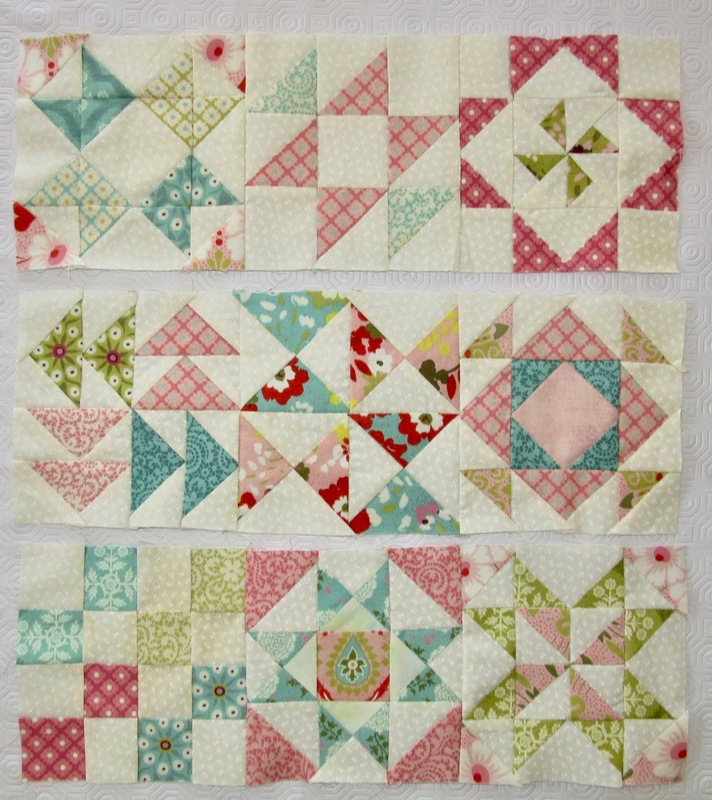 Hop over to the Aurifil linkup to see more versions of the Harvest block. 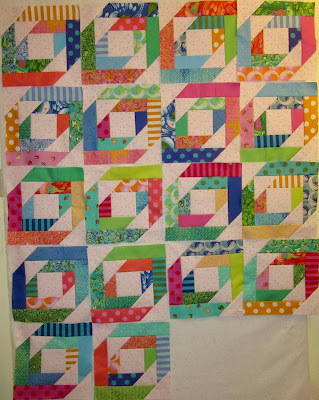 Also linking up to the Rainbow Scrap Challenge. It's been a lovely day of machine quilting the baby quilt for my daughter's best friend's baby. 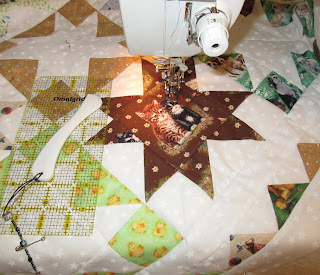 I realized I didn't show a photo of the finished top on my blog because this quilt went immediately from having the borders sewn on, to being pin basted, and then to being under the needle for machine quilting. It has been fun to notice the little animals as I quilt on by ... the cats, dogs, ducks and birds. It's so relaxing when you "get in the quilt zone", listening to music, and the sound of the sewing machine making lines of stitches. I stitched the usual horizontal and vertical grid between the blocks, and then stitched diagonal lines across the star blocks. I marked the lines using a Hera marker, which just makes a slight indentation in the fabric to stitch across, leaving no permanent line. 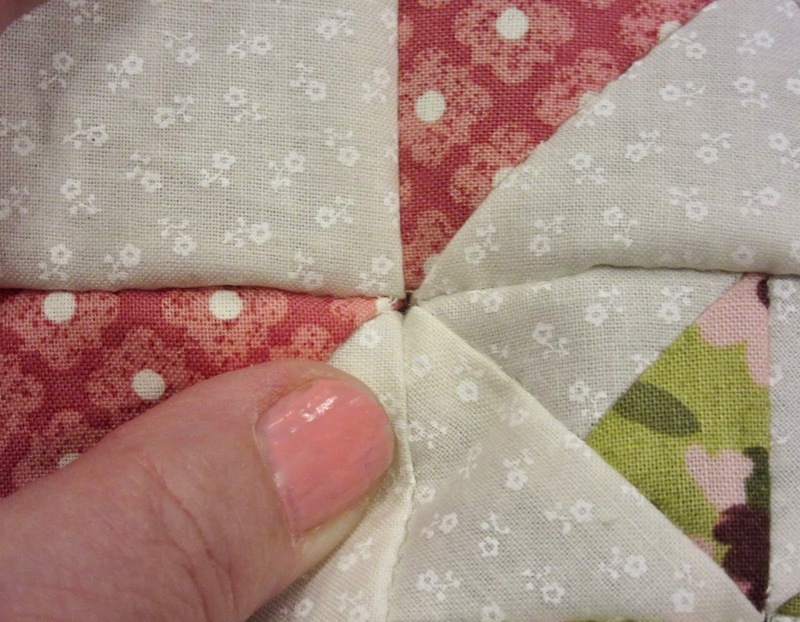 I mark each block as I come to it... mark, stitch, mark, stitch. The border is made of the baby HST blocks (from the sawtooth star points) joined together in flying geese blocks. I zigzagged around each point. 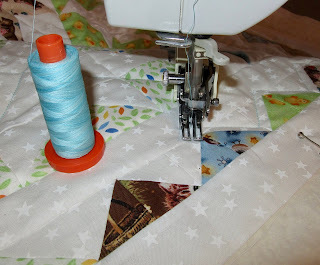 It was a lot of twisting and turning of the quilt, which my back has been protesting since I started that! It's almost done now and I look forward to hand stitching the binding for Slow Sunday Stitching. 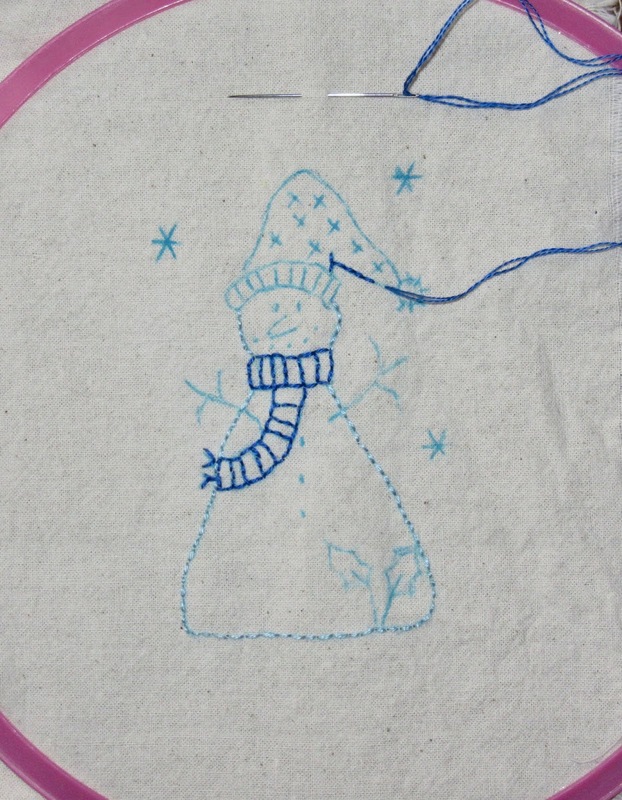 Loving the light blue slightly variegated Aurifil thread that I am using!